Last week I missed out on making a pasta dish. We have had a bit of business around here that had Grumpy out of the house a few nights so I had a hard time psyching myself up to cook a meal for just me. Friday night was our first night together in a few days so I decided I was going to make something delicious yet not terrible for our health/waistlines. I pulled out my George Foreman Grill and grilled some seasoned chicken tenderloins and made these yummy cabbage noodles to go with. Grumpy covered his tenderloins in Buffalo Sauce while I dipped mine in some of my favorite Sweet Baby Ray’s BBQ Sauce. It had been a while since I had sauteed any cabbage and I was craving it. We LOVE sauteed cabbage. Friends of mine from Potsdam, NY area talk about these cabbage noodles they get at a specific restaurant they frequent. I’ve never eaten at that specific place but cabbage and noodles sounded good to me so I went ahead and threw this together. It may not be what this restaurant serves up but it was pretty good to me! They probably don’t put carrots in the dish, but I felt I needed some color! 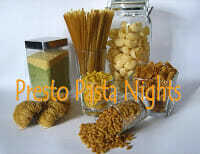 This is my submission for Presto Pasta Nights this week. The host for this week is Simona of Briciole. For information on how to join in with all us pasta lovers make sure to check out the Presto Pasta Nights webpage and don’t forget to visit Simona’s blog tomorrow for the round up of pasta meals eaten in the last week! Cook noodles according to package directions. Drain water from pasta and toss with 1 tablespoon butter. While pasta is cooking, in a large frying pan over medium high heat, saute carrots and onion in olive oil until they start to soften (about 3 minutes). Add chopped cabbage, salt and pepper and stir fry until cabbage is crisp tender and has a little caramelization. Toss buttered noodles with cabbage mixture, Serve! Next time I will add a little chili pepper flakes and/or saute in a flavored oil.I think that would give it a little more flavor, although this was yummy just as is with salt and pepper. This sounds great for a quick and easy week night supper! Yum. This is a very comforting dish Shelby! Wow sounds great for a quick dinner! Sounds very comforting indeed. Thanks for sharing with Presto Pasta Night. It's always fantastic when you do. I have never had the combination of cabbage and noodles: reading your post and looking at your photo has made me very curious. Thank you so much for contributing to Presto Pasta Nights!